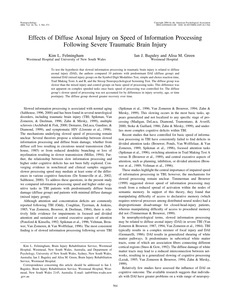 To test the hypothesis that slowed information processing in traumatic brain injury is related to diffuse axonal injury (DAI), the authors compared 10 patients with predominant DAI (diffuse group) and minimal DAI (mixed injury group) on the Symbol Digit Modalities Test, simple and choice reaction time, Trail Making Tests A and B, and the Stroop Neuropsychological Screening Test. The diffuse group was slower than the mixed injury and control groups on basic speed of processing tasks. This difference was not apparent on complex speeded tasks once basic speed of processing was controlled for. The diffuse group抯 slower speed of processing was not accounted for by differences in injury severity, age, or time postinjury. The diffuse group showed greater recovery over time.